For 31 years, the Durango Cowboy Poetry Gathering has made a concerted effort to build our outreach to local schools at all grade levels in Durango, Bayfield and Ignacio. 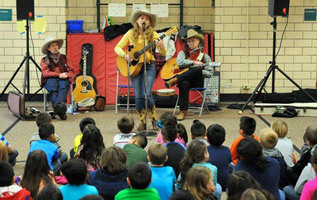 During the Gathering we send cowboy poets and musicians to perform in classrooms and assemblies. Last year, they performed over 45 times in in two days at these schools, including at the Denier Youth Services Center for juvenile detainees. 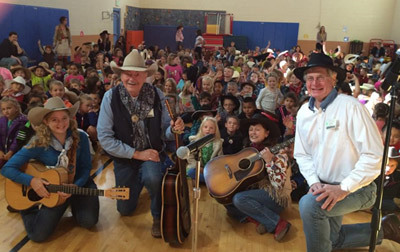 Cowboy Poetry and music is presented in the local Durango, Bayfield, Mancos and Cortez schools. Also at the 55 Plus Center, to Mercy Medical patients, at Sunshine Gardens Assisted Living, Cottonwood Inn and in Ft. Lewis College classes. These performances are done at no charge in order to allow all ages the opportunity to listen to poets tell the story of Western culture and lifestyle in poetry and song. The poets and musicians generously perform free at these venues for two full days. perform their own cowboy songs. the Poets in Schools program. The goodwill provided by these poets is beyond compare. The history they impart gives an education about our Western Culture to many children and people in our community who cannot otherwise attend performances at our venue in downtown Durango. sing Home on the Range!" 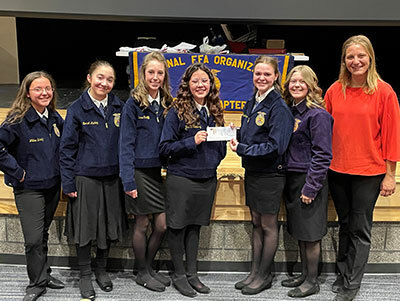 In February each year, local FFA student leaders make a formal presentation to the Durango Cowboy Poetry Gathering Board of Directors requesting funding for their Chapter. In 2019, the FFA will use the grant to assist in getting the students to the State Convention and National FFA Conventions. It was also used to assist students with their SAE projects which are all agricultural in origin, such as raising livestock, starting an Ag related business or starting and Ag related job. FFA advisor Gina Baker has skill and enthusiasm to keep the FFA students active and inspired as they learn ag industry business skills, public speaking, marketing and finance as well as traditional farming and ranching vocations. 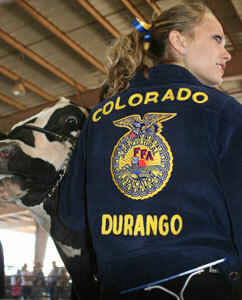 In return for the Cowboy Gathering grant, the Durango FFA students volunteer at several of the Durango Cowboy Poetry Gathering events. You’ll see them ushering at the evening poetry shows and assisting with the Cowboy Parade in their distinctive blue and gold FFA jackets. The DHS FFA chapter is dedicated to community service, leadership and promoting agriculture. Their members are becoming valuable citizens in the new Western lifestyles of America and the Cowboy Gathering is proud to assist them. For the 12 years in a row, the Board of Directors provided grant funding to the La Plata County 4-H Council. These funds were used to assist with their annual 4-H Horse Camp which was held at the La Plata County Fairgrounds in May 2018. 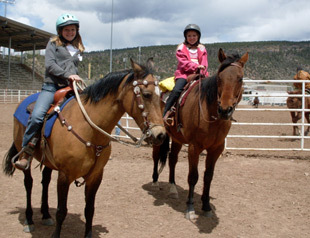 Forty youth, including 4-H'rs from Cortez, Pagosa Springs and Durango, attended with their horses. With adult supervision, the attendees camped out at the Fairgrounds for three days and had full responsibility for themselves and their mounts. The goals of the 4-H Horse Council are to develop leadership abilities, build character, and create responsibility and pride in the caring of a horse. 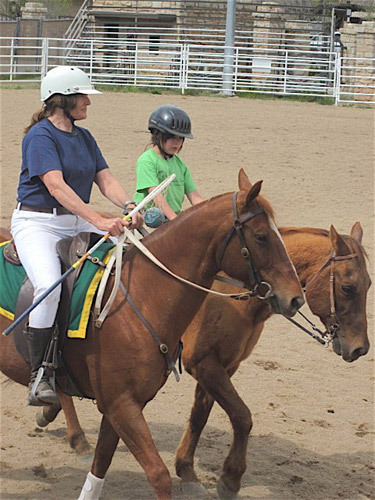 Participants in the 4-H Horse Camp learned to work in groups, and individually, with their horse. Volunteer instructors taught horsemanship, safety and friendly competition in barrel racing, gymkhana games and Western horsemanship patterns. The Durango Cowboy Poetry Gathering provides funding to support the La Plata County 4-H Horse Council and provides scholarships for their annual Horse Camp. The 4-H youth learn horsemanship, responsibliity and leadership. 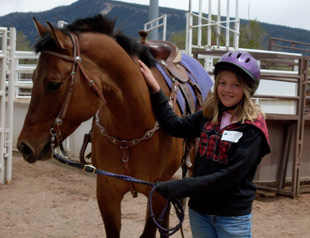 Girls love horses and the La Plata County 4-H Horse Council provides a safe environment for them to learn about horses and leadership. The Board of Directors of the Durango Cowboy Poetry Gathering has taken important steps to insure that the culture and lifestyles of the American West will continue through these valuable youth programs. The Basin Rodeo Team is part of a larger organization Colorado State High School Rodeo Association. Their mission is to promote the highest type of conduct and sportsmanship and expose it's positive image to the general public. The also preserve our Western heritage, promote family values and bonding, and offer the opportunity of continuing education. They also maintain the highest regard for the livestock and promote humane treatment of all animals. 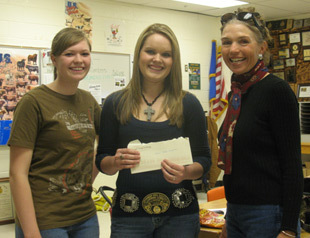 High School Rodeo teams compete in six rodeos in the fall, and six in the spring during school year. The finals are always held in July with over 1500 competitors coming from all over the United States. 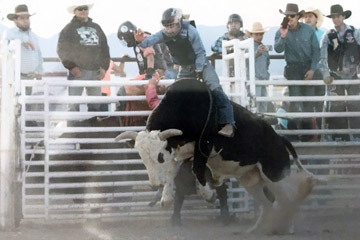 In 2018 the Basin High School Rodeo team sent three local students to the finals in Rock Springs, WY. Dustin Sanchez from Ignacio competed in bullriding, Madison Story of Bayfield in pole bending and Lexie Crawford of Hesperus competed in cutting horse. These three young people exemplify the Western lifestyle and the high quality of sportsmanship and leadership promoted by the National High School Rodeo Association. 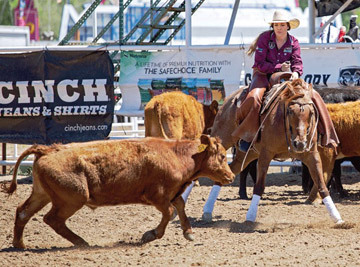 Lexie grew up on a working ranch in Hesperus, and in 2012 the Durango Cowboy Poetry Gathering awarded her the "4-H Cowgirl of the Year" for her hard working maintaining ranching traditions. The sponsor of Basin Rodeo Team is Shannon Story. She works hard to make sure the kids attend these sanctioned rodeos and live up the code of High School rodeo standards. The Durango Cowboy Poetry Gathering is proud to have these upstanding young people help us with Cowboy Parade on Saturday October 6th at 10am on Main Ave. They help keep their communities "Western”. 2018 Colorado State High School Association Girls Cutting Champion.